My mother steady jokes about marrying me off to a snail farmer and I just stand there smiling but deep down I actually imagine that it wouldn’t be such a bad idea as long as he is French and our farm is in Lyon, France. Oooo we have to eat Escargots à la Bourguignon atleast once a week too…..that’s how much I love snails! One evening, it rained snails on me as she (my mother) and H-Baby each gifted me these delicious creatures. Of course the universe was letting me know it was time for a Snail Cooking Party. In a bowl, mix together butter, white wine, pressed garlic, salt, black pepper and chopped parsley leaves (I wanted this mix blended but my stick blender decided to embarrass me). Cover and leave to rest for about 2 hours. Stuff your snail shells in this order: butter mix, snail, butter mix again and place in dish with a sprig of rosemary. Bake the snails for about 10 mins (butter mix will begin to bubble). Cut baguette up into thick slices. Spread mixture of pressed garlic and butter on bread slices. Top with rosemary leaves and Toast in oven for about 3mins. 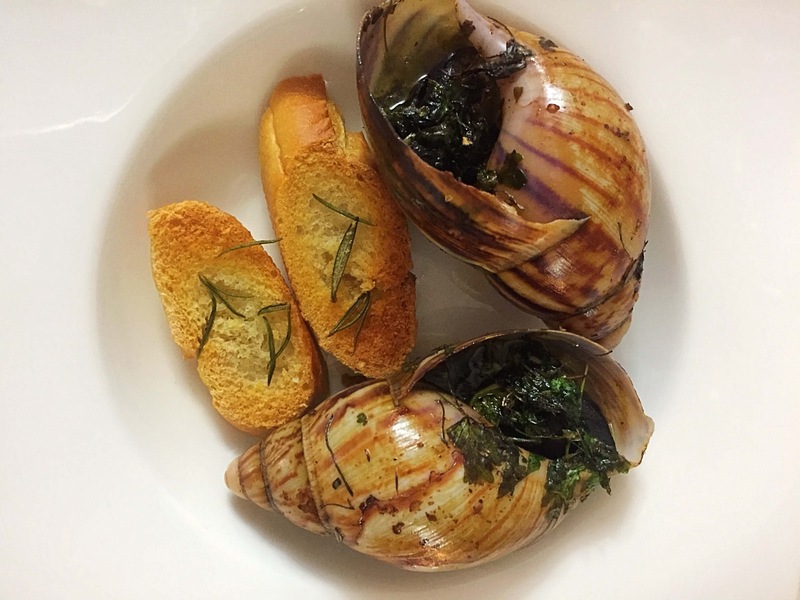 Serve baked snails with bread. I was craving Nigerian peppersoup and I had leftover wine from the parsley butter recipe so why not add it to enhance flavor! The end result was a very spicy bowl of yumminess…. Cook snails with water, Nigerian peppersoup spice, bouillon cubes, black pepper and salt for about 10mins. Add white wine, crayfish and rosemary sprig (liquid tends to reduce so baste to keep snails moist). Cook till sauce reduces by half. I won’t mind marrying a lady who farms snails either. My love for those small juicy creatures tho. Awesome write-up and pics! I love escargot. Never tried making it at home or even trying. You’ve inspired me. Now I may! OK, so what makes peppersoup peppersoup is just the spice mix? What does it taste like? It’s not one I’ve come across before.